An elegant laboratory grown diamond bracelet made with round brilliant diamonds surrounding a brushed metal hexagon. Available options: platinum, 14k or 18k gold: white, yellow, rose. 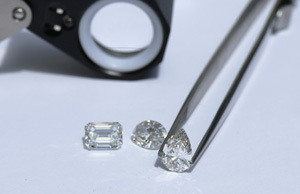 Learn more about Ada Diamonds custom jewelry design process and sustainable, conflict-free lab diamonds. Ada Diamonds Design Description- A modern geometric style bracelet that features round brilliant lab grown diamonds surrounding a brushed metal hexagon in 14k white, yellow or rose gold settings with multiple adjustable chain lengths to choose from. All of Ada's bespoke fashion pieces are custom made to order. Want to change something about this design? No problem! Our friendly Concierge are here to help you build a unique, stunning piece of fine jewelry. Select "Inquire" to get started!